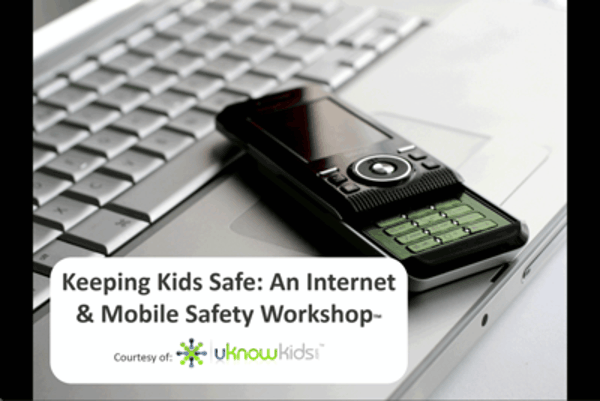 uKnowKids' "Internet and Mobile Safety Workshop for Parents" will provide you with a better understanding of the technologies your kids are using today as well as the issues they are facing when using these technologies. During the weekly workshops, we will share the latest statistics, videos and expert tips so that you have the information you need to communicate with your child about how to make the safest possible decisions with technology. The uKnowKids "Internet and Mobile Safety Workshop for Parents" is presented by Tim Woda, an Internet & Child Safety Advocate, a Co-Founder of uKnow.com and the author of Keeping Kids Safe: A Guide for Parents of Social and Mobile Children. Workshops will be in session weekly on Wednesday nights from 7:30-8:30 PM EST. The Internet and Mobile Safety Workshop for Parents is an invaluable investment in your family. Thank you in advance for your help in making the digital world a safer place for everyone. The workshop begins Wednesday, April 1. Get your ticket and view all upcoming workshop session dates and times here! BONUS: Current uKnowKids customers are invited to request a VIP invitation to attend the workshop for free! To request a VIP invitation, send a note to support@uknowkids.com.